I've been having so much fun using my Instant Pot and aside from cheesecake, I wanted to try another dessert - flan! 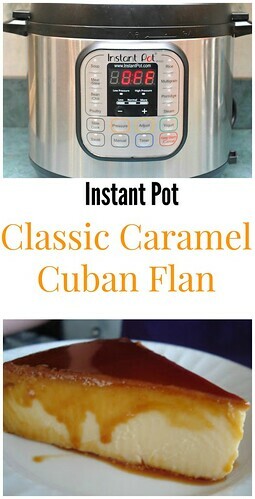 There are many varieties of flan but my favorite would have to be the Cuban style. Being Filipino, the Filipino version of Leche Flan is smooth and silky. It's rather delicate and no too sweet. But after having the Cuban style flan made by my friend Lazara, I was sold on the thick, solid and richer Classic Caramel Cuban Flan. When made traditionally, it takes quite a bit of time to prepare - at least an hour. But when pressure cooked in my Instant Pot, a mere 10 minutes is all I need. Granted, flan is not a quick dessert idea... because even after 10 minutes of pressure cooking, it will still require several hours to chill and set before serving. But trust me, it's definitely worth the wait! I've also included the recipe variations for Coconut Lime, Mango and even Guava flan below! Have ready a springform pan with bottom wrapped in foil to prevent leakage or a small cake pan that fits inside your IP. Press MANUAL on the IP and insert the trivet; add 1 cup of water. In a saucepan over medium high heat, add the sugar and allow it to caramelize. This will take about 5-7 minutes and avoid the temptation to stir! Once you have a caramel, remove from the heat and place in springform pan of springform pan or small cake pan. Place the caramel coated springform pan or small cake panon the trivet. In a blender, add the remaining ingredients and blend until fully combined. Pour this mixture into your caramel coated springform pan or small cake pan set in the IP. Cover filled springform pan or small cake pan with a silicone lid or foil. This prevents water from getting into the flan while it pressure cooks. When the IP beeps after pressure cooking for 10 minutes, allow your IP to naturally release pressure completely. Allow several minutes for this to complete. While naturally releasing pressure (also known as NPR or NR), the display will reflect numbers counting up from 1. The numbers indicate how many minutes the IP has stopped cooking since it beeped (or how many minutes it has been naturally releasing pressure). No need to touch your IP while it naturally releases pressure. The pin at the top of your IP will drop when all pressure has been released and it's safe to open. Carefully remove your flan from the IP and cool on a wire rack. Once cooled, place in your refrigerator to chill overnight. To unmold, invert the pan onto a serving plate. For Coconut Lime Flan: substitute the evaporated milk with coconut milk and add 1 tablespoon freshly grated lime zest in the blender with the other ingredients. For Mango Flan: add 1/2 cup fresh mango chunks in the blender with the other ingredients. For Guava Flan: add 1/2 cup guava paste in the blender with the other ingredients. I followed your exact recipe and my flan did not come out firm it was super liquidy. Is that how it is until chilling overnight? flan is supposed to be pretty jiggly, but not liquidy. It will set while it cools and then firm up in the fridge overnight. you may need to increase cook time by an additional 10 minutes if your flan is loose. just cover it back up and cook for 10 more.